I found myself sitting in a park on a cold October day. The leaves on the trees were full of color. Yellow trees to my left, red trees to my right, and a mosaic of colors on the ground. The grass was a deep green color, at least the areas not covered by leaves. The swimming pool was drained and winterized, and the park benches were all placed in the closest shelter house. The playground equipment was different too. The swing sets looked empty, because the swings were taken off for the winter. Springs were stripped of their horses so they would not crack during the cold winter. I didn’t need bug spray since it was too cold for mosquitoes or gnats to bother me. The most important part of the park was also missing, the kids. I didn’t notice any laughter or tears, no cuts or scrapes, no running or tag, no swimming or hugs, no friends and no fun. As I walked though the leaves, I uncovered a flower protected by warmth, a reminder of the past season and a glimpse of the future of good things to come when the seasons do change. Years ago bison covered the plains similar to new leaves on a spring tree. They migrated with the seasonal change. They traveled north of The Black Hills during t he summer and south of The Black Hills during the winter. The movement of Native Americans coincided with the bison migration. The Indians main source of food was the bison. The Indians used every part of the bison because they respected the animal and considered it very sacred. They used the meat for food, the hide for warmth, the stomach to hold water and the bones for tools and arrows. The survival and livelihood of the Indians depended on the availability of the bison. The number of bison during the 1600s was very abundant. It is estimated that during the early 1600s there were 30 to 60 million buffalo. There is an old saying that all good things come to an end. Unfortunately, this was true for the Indians. No one ever imagined the buffalo would almost become extinct by 1890. 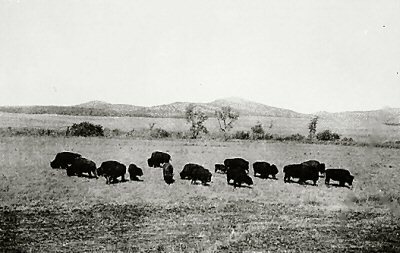 Just as leaves fall from the trees before winter, the buffalo were disappearing from the grassy plains. There was an increase in demand for the fur of the buffalo. Millions of animals were slaughtered during the 1800s. The livelihood of the Indians as they knew it was gone. The United States Government set up agencies on reservations where the Indians could receive clothing, food, and shelter. Even the people of Crazy Horse and Red Cloud had to come to lands set-aside for them. It was either that, or starvation. As for the people a hundred years ago who perhaps thought reservations were places where American Indians would drop their traditional ways…history proved them wrong. Just like we have seen an increase in the population of buffalo today, we see old Indian traditions still celebrated on reservations. Just like the bison, the people of the bison are forever part of South Dakota.